One of the best flowering native vines is Hoya australis. It gets its common name from the rounded heads of waxy flowers that appear in late winter and last well through to summer. 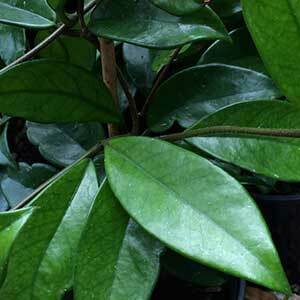 The foliage is a glossy deep green and rounded, again with a waxy feel to it. Be aware that their are sub species of Hoya australis. One with rounded leaves, and the other with narrow lance shaped leaves. It is a strong growing plant in its natural environment and the flowers can reach to 10 cm (4 inches) across. Flowers are a white to blushed pink with a deep pink to red marking in the centre. Flowers are fragrant having a strong spicy perfume. Although this is a plant that grows naturally in sub tropical to tropical climates it is also widely grown in cooler climates, often as an indoor plant. Except in the warmer climates, Hoya australis is usually grown in containers. This allows it to be overwintered indoors, and it does make a very attractive house plant. Best in a well drained soil, it also is aslant that grows best in filtered light. Like many plants, Hoya australis also like to have its root system contained, so do not over pot it. Over time the is climbing twining vine can reach 4 – 5 metres in height. When grown in a container it will need adequate support and it will need to be pruned back to maintain a bushy habit. Although they are naturally a climbing plant, they can also be grown in hanging baskets. We suggest using a dilutes fertiliser such as miracle grow, when the plant is in active growth. Yellowing leaves can be a problem with Hoya australis. It is usually caused by cool to cold temperatures especially in cold climates over winter. Not flowering is another problem, usually caused by lack of light. Hoyas do not like full sun, however good filtered light is essential for flowering. Hoya australis can be propagated from seed, or more easily from cuttings. A length of healthy stem with 3 nodes on it can be removed by cutting just below the leaf node. Use a propagation box and a propagation mix of 3 parts perlite to 1 part coco peat or peat moss. Roots should form within 1 month.